The 55UH770V makes a great first impression thanks to its glinting metallic design and welcoming webOS menu system. It even looks like a good value at £950, too, considering it supports high dynamic range and native 4K playback. Sadly, though, turn it on and things go downhill fast. LG’s high-end LCD televisions for 2016 aren’t just UHD TVs; they’re ‘Super’ UHD TVs. As well as conjuring up visions of TVs flying around with red capes on, daring to call your TVs ‘super’ raises pretty high expectations of how they’re going to perform. Just as well, then, that the 55UH770V talks a pretty good talk where its specifications are concerned. For starters, it carries a native 4K/UHD-resolution screen. It’s also designed to deliver enough brightness to handle the latest high dynamic range picture technology, and supports the expanded colour ranges you get with all current HDR sources. Its edge LED backlight system is supported by local dimming, too, so that different amounts of light can be sent to different parts of the image - a usually essential requirement for a convincing HDR LCD image. Finally, its smart features combine LG’s own brilliantly easy to use webOS platform with the Freeview Play system to ensure you get more of the apps most people really want to find on a smart TV: Netflix, Amazon, Now TV and the catch up services for the UK’s ‘big four’ terrestrial broadcasters. As if the 55UH770V’s sub-£1,000 price, 4K and HDR features weren’t already attractive enough, LG has wrapped it all up in some seriously appealing bodywork. Its light grey colouring and metallic sheen make it look both distinctive and expensive, while the slimness of both its frame and boomerang-like stand give it an airy, elegant feel. The frame is slim enough, too, to essentially fade from view when you’re watching the TV. The 55UH770V’s key connections of three HDMIs, three USBs and integrated Wi-Fi/Ethernet options are good enough for such an affordable 55-inch 4K TV - especially as the network options support playback of multimedia files from networked DLNA-enabled devices as well as access to LG’s ‘walled garden’ of online features and content. One last intriguing part of the 55UH770V’s design is its remote control. This unusually sculpted handset differs from the norm in that it lets you control a cursor on the TV just by moving it around and features a unique vertical wheel device at its heart that you can use to scroll quickly up and down lists of menu options. 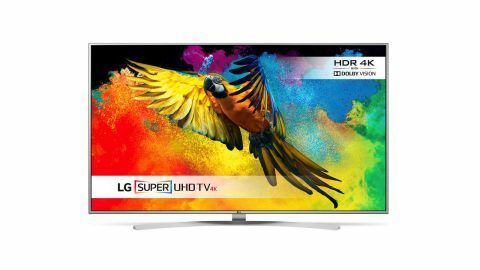 Screen sizes available: 49, 55, 60, 65 | Tuner: Freeview HD, Freesat HD | 4K: Yes | HDR: Yes | Panel technology: Edge-lit LCD | Smart TV: Yes, WebOS 3.0 and Freeview Play | Dimensions: 1239 x 717 x 53mm (W x H x D) | 3D: No | Inputs: Three HDMIs, three USBs, RF input, component video input, Ethernet port, optical digital audio output, composite video input. Design TL;DR: The 55UH770V is seriously attractive and well built TV for its money, looking more high-end than mid-range. Although others have tried to copy it with varying degrees of success, LG’s webOS operating system is, for me, still the king of the smart TV world. For starters it puts an immense amount of content at your disposal while taking up remarkably little of your precious screen space. Its scrolling bar of richly coloured content link icons also employs lots of little graphical tricks to ensure you always know exactly where you are. It’s exceptionally easy to customise the home screen to prioritise the apps you use the most, and the menus react at lightning speed to instructions from the remote. Basically webOS is empowering, friendly and slick - everything a smart TV interface ought to be. When it comes to the amount of content available via LG’s online platform, implementing the Freeview Play system to provide all of the UK’s main catch up TV platforms solves LG’s long-running shortcomings in that area. Support for the BBC iPlayer, All4, ITV Hub and My5 platforms is now there alongside the likes of Netflix, Amazon and NowTV. It’s worth adding, too, that the Netflix and Amazon apps both support HDR and 4K content delivery. Smart TV TL;DR: Three years and only a few small tweaks after its debut, LG’s webOS smart platform continues to be the most easy to use and effective interface in the smart TV world - especially now that it’s supported by Freeview Play. Feeding the 55UH770V a selection of Blu-ray movies quickly reveals a major flaw in its picture make up. Namely, whenever it has to handle a dark scene, it struggles to achieve anything like a convincing black colour. Parts of the picture that should look black instead look grey. This immediately makes them look less immersive and realistic, and leads to dark areas looking low on subtle shadow detailing and depth of field. Colours in dark scenes, too, have their tones affected by the veil of greyness that hangs over them. And if you’re using the local dimming system you’ll often see quite distinct vertical bars of light running the full height of the picture around bright objects that appear against dark backdrops. Fortunately you can improve things from this less-than-satisfactory starting point by hacking back the set’s backlight setting to less than a third of its maximum value. Blacks now look much less grey, and you can use the local dimming system to boost contrast without it causing such overt light ‘banding’. Obviously hammering the backlight so substantially takes a serious chunk of brightness out of the images you see. For me, though, it’s a trade worth making - at least when watching contrast-rich content like a typical film in a fairly dark room. Less brightness also means less intense colour, but fortunately the 55UH770V has enough innate colour potency at its disposal to still look passably punchy even with the backlight running so low. Now we’ve shifted onto a more positive track, the 55UH770V is also decent at upscaling HD sources to its native UHD pixel count, creating a fair - though not class-leading - level of extra sharpness and detail without excessively emphasising source noise. Motion is fairly clear if prone to the occasional stutter too, and while experience suggests that the IPS panel technology at the 55UH770V’s heart is likely responsible for the TV’s contrast woes, it does also mean you can watch the 55UH770V from a slightly wider viewing angle than TVs that use the alternative VA panel types before colour saturations and contrast are severely compromised. Finally, it’s worth adding that the 55UH770V’s backlight issues will be less troublesome - though they certainly won’t disappear entirely - if you mostly watch TV in a bright room. HD/SDR TL;DR: A lack of native contrast and heavy-handed local dimming mean you have to remove a lot of brightness from the 55UH770V’s pictures to make them look good. Sadly the 55UH770V really can’t handle HDR at all. The lack of contrast noticed during SDR playback becomes spectacularly more of an issue when the TV has to handle the much more extreme brightness HDR delivers. The amount of greyness over scenes that should look dark jumps to a much more aggressive level, while the vertical stripes of light around stand-out bright objects become more defined and distracting. Since this is HDR we’re talking about, moreover, you can’t just ratchet down the backlight setting like you can with SDR to try and reduce the backlight problems. After all, if you do that with HDR you’re not really having an HDR experience any more. Plus the picture will tend to become quite unbalanced, with dark areas looking over-dominant and devoid of detail. The 55UH770V does, though, have enough brightness and colour intensity to handle light HDR scenes quite nicely; certainly they look more dynamic and vibrant than SDR footage. To be clear, I’m not talking here about the same sort of extreme SDR-to-HDR step up you get with the best screens this year - in particular Samsung’s much more expensive KS9500 and KS9000 series. But the 55UH770V gives as much of an HDR lift to pictures as you might reasonably expect for £950. As with LG’s 2016 OLED TVs, Dolby Vision HDR content played on the 55UH770V delivers superior results to the much more common HDR 10 system. The picture isn’t as bright, but it’s richer in colour detailing and delivers a more natural, cinematic balance between HDR’s light and dark extremes. Dolby Vision tries hard, too, to solve the puzzle of how to get a convincing backlight performance out of the 55UH770V. In the end, though, even Dolby Vision’s key trick of being able to use dynamic metadata to optimise the HDR image on a scene by scene basis never makes dark content look completely involving or natural on LG’s TV. While the 55UH770V is a bust with HDR content, it does do a strong job of reproducing the extra sharpness and detail native 4K content can provide over and above HD sources. In fact, at certain moments, when the right picture content planets come into alignment, the 55UH770V’s 4K pictures can look quite beautiful. I have to conclude this section with a couple of further problems, though. First, during Ultra HD Blu-ray playback I noticed motion and camera pans in the image suffering with quite defined stuttering/momentary freezing, no matter what setting you had selected for the TV’s motion processing. There are times where you don’t really notice this problem to be fair, but it can become infuriating during action scenes. The final flaw is that unlike most other brands now, LG doesn’t allow you to access the 55UH770V’s Game preset when the TV is running in HDR mode. This means that if you play an HDR game such as Deus Ex: Mankind Divided on LG’s TV, you will be hampered by around nearly 70ms of input lag (the time it takes a TV to render image data) versus just 30ms when using the Game setting in SDR mode. 4K/HDR TL;DR: The same backlight and contrast flaws that cause issues with standard dynamic range content leave HDR looking pretty nasty, frankly - and this time just reducing the backlight setting isn’t a satisfactory fix. LG has developed a welcome knack for getting good sound quality out of very thin TVs, and that knack persists with the 55UH770V. The first thing that strikes you is how open and well-rounded its mid-range is. This helps voices always sound convincing and clear, stops action scenes from sounding so cramped that they become harsh, and means that the speakers can give a reasonably convincing sense of soundstage escalation as action films shift through their gears. Bass reproduction is surprisingly potent for such a slim TV too, helping the 55UH770V avoid that thin, unrealistic tone action scenes usually suffer with when watched on skinny TVs. The bass doesn’t sound baggy or over-dominant either, and nor does it cause the TV’s cabinet to rattle. The 55UH770V isn’t as good as some rivals at projecting every tiny audio detail, but this is a small complaint in the context of its general audio prowess. Sound TL;DR: The 55UH770V delivers a polished, well-rounded audio performance that belies the TV’s slinky bodywork. With the 55UH770V’s contrast problems undermining both its SDR and, especially, HDR performance, it’s not hard to find alternative TVs that will serve you better. An extra £130 would get you Panasonic’s five inches smaller but much better performing TX-50DX802, for instance - complete with its eye-catching easel-style design.Or, sticking with Panasonic, the 55-inch TX-55DX750 is also a superior performer for around £100 more than the LG. Samsung also has an excellent 55-inch HDR-friendly TV in the shape of the 55KS7000 - though this will, to be fair, set you back £1,300 at current pricing. It seems to me, though, that if you’re going to buy an HDR TV you might as well either spend enough to get one that actually delivers an engaging HDR picture, or else save yourself money by buying a TV that doesn’t support HDR at all. The 55UH770V scores high on raw shelf appeal. Its crisp metallic form and promise of both 4K and HDR picture thrills make its £950 price look pretty tempting. Its charm is ultimately severely dented, though, by a sub-par picture performance, especially with HDR.